Was Google Update on 17th October 2015 an update to Core Algorithm? 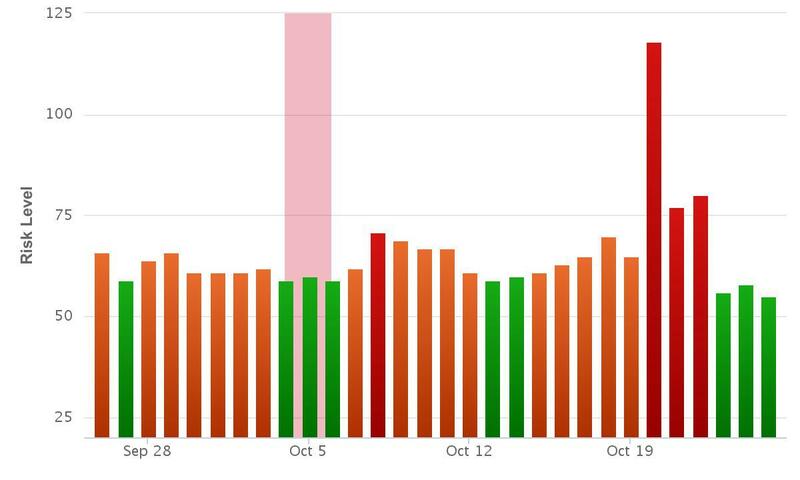 SERP trackers indicate a significant Google Update commencing on the 17th October. Google has indicated it a result of changes to the Core Algorithm. Published: Oct 26, 2015. 08:50 +0100. We have been tracking some significant movement in the SERPs from around the 17th October that indicated a major Google Update had taken place. The only official information about the update from Google (Gary Illyes) is that it most likely relates to a core algorithm update, rather than Panda or Penguin. The MozCast tracker shows a significant spike in volatility on the 17th October, with a reasonable amount of volatility continuing until the 22nd October. MozCast April 17th October. © Moz. The Rank Ranger Risk Index shows one of the largest spikes we have seen in its index on the 20th October, with volatility continuing for three days until the 22nd October. This is slightly later than MozCast, but we don’t read much into the discrepancy. Rank Ranger Risk Index. © Rank Ranger Risk Index Google Update October 2015. What is the Update Targeting? Updates that are not unique to Panda (website Quality) or Penguin (Spam i.e. low-quality backlinks) can be notoriously difficult to identify. Despite all the chatter around the web of the update, there doesn’t seem to be anything concrete. One repeated theme throughout the SEO forums is mention of a Halloween Zombie Update, but this talks more about users noticing that their traffic is not converting and that the visitors are behaving like zombies (i.e. bot like). However, discussions about Zombie traffic are nothing new, and it may not even be related to this recent volatility. We do not believe this is related. Another theory is that October 17th is precisely a year since Penguin 3.0 was released, and significant evolution in the algorithm targeting webspam (i.e. spammy backlinks). We have previously mentioned that Google Penguin is due to operate in Real Time from the next update (reportedly due this year), so it is possible that some parts of the Penguin Algorithm are slowly being incorporated into the core algorithm. Gary Illyes recently said on the 22nd October that “Google Penguin is not ready for prime time yet.” With Penguin very much on their minds, it is possible that it is related. Despite many websites that use the Sape Network (Blog Network for spammy backlinks) being hit on the 15th October, this update does not seem to be related. Some users suspect this is just a general “shake-up” rather than anything specific being hit. One user reports that their Black Hat SEO website that used low-quality web 2.0 properties was hit. This could indicate a tweak to the anti-spam parts of the algorithm. Could it be a coincidence that the most active discussion on this was on a forum notorious for discussing spammy black hat techniques? We think not. It is unfortunate there isn’t much decent web chatter that enables us to get an idea of what this update was targeting. This could be an indication in itself, in that it is just a general update fine tuning their core algorithm in many places. We don’t believe that high quality “white hat” websites have been particularly affected by this.